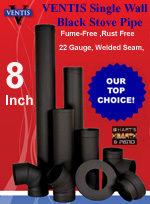 "Patent Pending” Fume-Free finish eliminates the smell on initial firing. The Industry's first "Patent Pending” Slip connector with Gap Collar. Olympia's Premium Packaging ensures product quality during shipment! 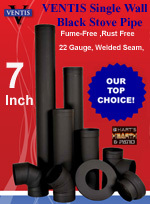 Why Olympia's Ventis Black Should Be Your ONLY Choice for Single Wall Black Stovepipe No More Fumes! Olympia's patent pending finishing process eliminates noxious fumes from enveloping the home on initial firing of the heating appliance! 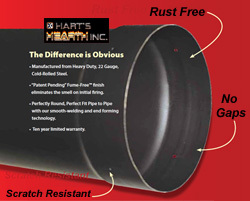 Olympia's unique finishing procedure removes all unsightly rust and visible corrosion from the pipe! Olympia's patent pending Gap Collar removes noticeable gaps between the slip connector sections and the stovepipe! Browse these categories under "Ventis 22 Ga. 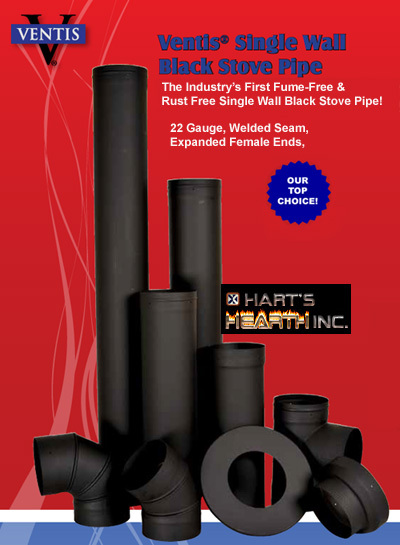 Single Wall Stovepipe"